One of my favorite portable gas grills is on sale today only at Amazon. The Cuisinart CGG-200 All-Foods 12,000-BTU Tabletop Propane Gas Grill is going for $118. This grill has a serious cast iron grill grate that will produce great grill marks and that does not rust. Last week, I took mine to the beach in Galveston and left it outside on the balcony where it was exposed to large amounts of sea spray for over a week. I see no signs of rust on the stainless steel hardware or the iron grate. That was the second time in a year that I have taken it to Galveston for at least a week. Galveston’s salt spray is anything but friendly to things made of iron. The thin wire grill grates that come with most portable grills are a joke. I have two large kettle grills, both of which are made by famous names, and their wire grates serve little purpose other than to hold the food in place. Fortunately, this is not the case with the Cuisinart grill grate, which produces large grill marks that add umami (extra flavor) to the food. This heavy grate helps to cook the food, unlike the wire grates in my kettles. This grill is great for tailgating, picnics, vacations and anywhere portability is required. It accepts widely available 14.1- and 16.4-ounce propane gas canisters and it can be connected to a large propane tank with an adapter. I like to bring this grill with me for adding extra grill capacity to cookouts. The pretty stainless steel hood features a nice embedded thermometer. On windless days, mine hits 600 degrees F with the gas valve wide open. This is perfect for searing thin-cut rib-eye steaks and cooking them to medium-rare perfection within about four to five minutes. I use my Cuisinart to grill bacon (oh yeah! ), pineapple, onions, sausage, hamburger, pork, shrimp and steak. The grill marks that it leaves on pineapple are awesome and I will post a picture when I do my next batch. Last year, I bought one from Amazon for $109 when it went on sale for one day. All I can say is that I’ve gotten way more than $109 of utility out of it. 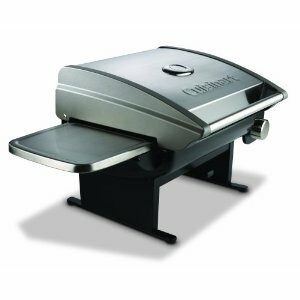 If you don’t yet own a gas grill, the Cuisinart All Foods Tabletop Grill will give you a great introduction to gas grilling. Frankly, it’s hard to think of a less expensive way to get started with the gas grill. This entry was posted in Grills by Harold. Bookmark the permalink.